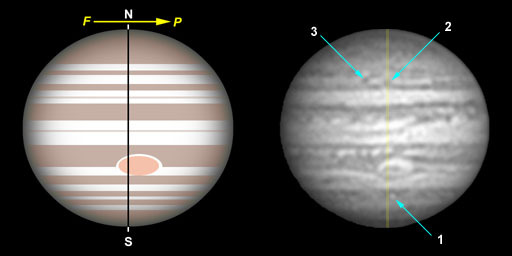 It is not by chance that Jupiter is frequently nicknamed the "planet of the amateurs"... Its magnitude (ranging from -1.3 to -2.7), its large apparent diameter (about 30 to 60 arcsec during conjunction and opposition, respectively), its long visibility period (about 360 days in each one of the apparitions that last for 398 days), its fast-rotating disk full of dynamic colored features, and its cohort of bright satellites, make it an irresistible target. Naked-eye observations clearly allow the recognition of a bright star-like object that changes its position in the celestial sphere in an slow easterly motion that places it in a different zodiacal constellation each year. Conjunctions of Jupiter with the Moon and other planets like Venus should not be missed, since they constitute a very pleasant display to watch and photograph. 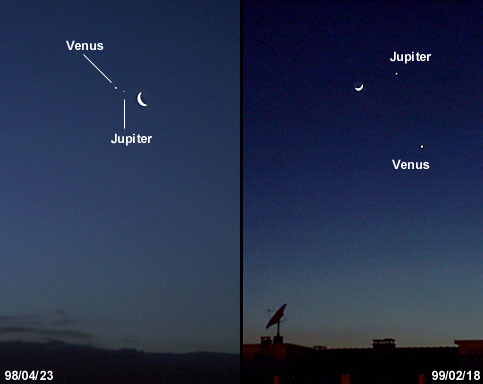 The above image shows two of such conjunctions, that occurred at dawn in April 4, 1998 and at dusk in February 18, 1999. Due to its large apparent diameter (about 30 to 60 arcsec during conjunction and opposition, respectively), Jupiter's disk already becomes visible when the planet is gazed through small binoculars. The four Galilean satellites Io, Europa, Ganymede and Callisto are also readily seen, appearing as star-like objects that shine at magnitudes of about 4.5 (Ganymede) to 5.5 (Callisto). 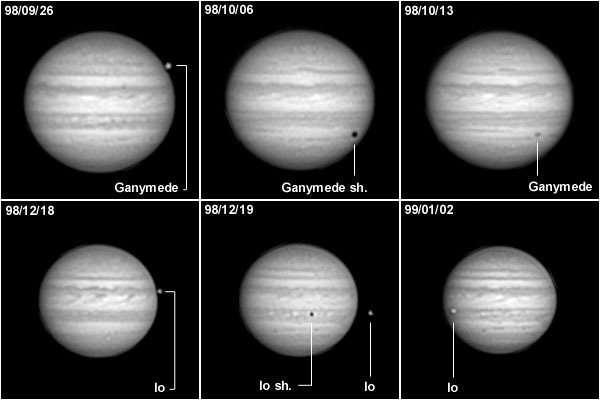 They characteristically align themselves following the equatorial plane of Jupiter, and will surely move with respect to each other when observed at a small time-lapse (e.g. 1h). All satellites may not always be visible. Occasionally, some of them can pass in front or behind the Jovian disk, can cross the cone of shadow produced by Jupiter, or can become so tightly positioned that the magnification provided by binoculars may be insufficient to discriminate them. 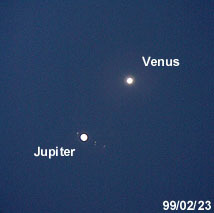 The above image shows one of the interesting phenomena that deserve watching, specifically a tight planetary conjunction involving Jupiter and Venus that occurred on February 23, 1999. Both planets were only about 8 arcmin apart at that time, a figure that nearly represents 1/4 of the apparent diameter of the Moon. The disk of Venus was smaller than that of Jupiter, but it was shinning much brightly. The telescopic observation of planet Jupiter is quite rewarding, even through a small instrument. The planetary disk is very well defined, clearly showing a polar flattening that makes its equatorial diameter about 1/16 larger than the polar diameter. A banded pattern that runs parallel to the alignment of the Galilean satellites is also obvious on the disk. It results from an alternate positioning of light regions called zones, and darker ones named belts. Even the most modest telescope will show two dark belts and a light zone running between them, all situated in the planet's equatorial region. The brightness differences between Galilean satellites will also be obvious, as will be their motion. 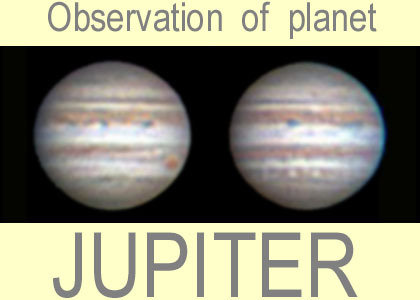 If seeing conditions are appropriate and if the planetary disk shows a distinct feature at the time of observation, it will surely be noticed that the planet Jupiter rotates quite fast, from east to west (celestial). A full rotation takes less than 10 hours which, at least theoretically, does allow us to follow a whole rotation during a long winter night. As a consequence of this motion, any feature present on the disk will travel from the eastern or following (f) side of the planet into the preceding (p) or western side, eventually until it disappears in the p limb. If satellite motion is followed it will be apparent that in a few minutes a given satellite can show an east-to-west movement or, on the contrary, that it will move in the opposite direction. Actually, all Galilean satellites move in the same direction as the Jovian disk (from east to west). 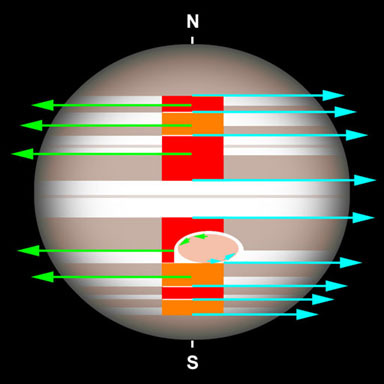 What happens is that we may be observing them in quite different positions of their orbits, namely when they are going to pass, or have passed, in front of the planet (exhibiting an east to west apparent motion) or when they will pass, or have passed, behind Jupiter (showing an west to east apparent motion). 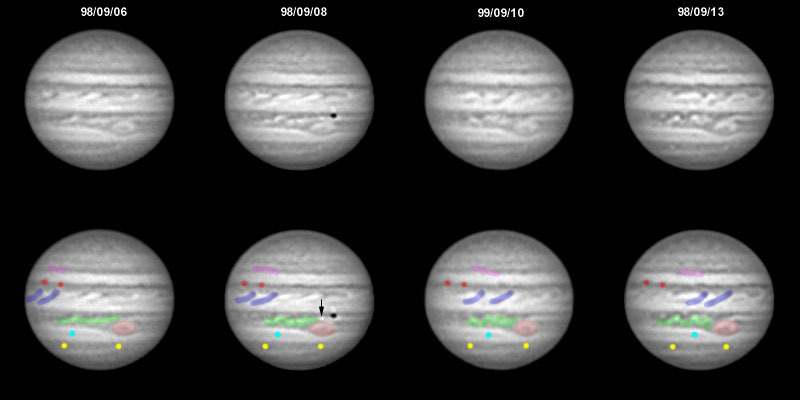 The above image and animation exemplify the changes that took place in about 1 1/2 hours of observation on September 9, 1996. The animation also shows planetary rotation. It is evident that Callisto is the dimmest of the four Galilean satellites and that, as occurs with Io and Ganymede, it shows an west to east apparent motion. 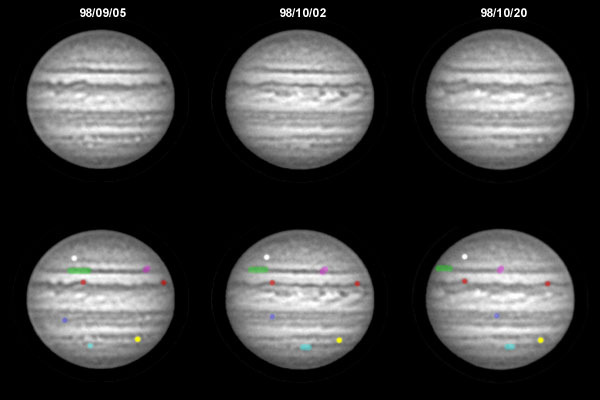 With time it becomes invisible (yellow arrows), since it entered Jupiter's cone of shadow only to exit after the observation run had ended. This phenomenon is called an eclipse. A considerable amount of time after the session's end, Ganymede disappeared when it passed behind Jupiter. This event is called an occultation. Only Europa showed an east to west apparent motion, and in fact it passed in front of the Jovian disk shortly after the end of the session. During that event, called transit, it projected its shadow onto the Jovian disk. A high quality instrument with larger aperture will surely reveal much more details than those described above, but only when properly collimated and, most importantly, when atmospheric seeing is favorable. Under these conditions the Jovian disk will reveal its often subtle colors (e.g. white, blue, light and dark browns, orange-red), and the interfaces between light-colored zones and the much darker belts will show numerous irregularities. Blue festoons and white plumes located near the planet's equator, and the light-orange Great Red Spot (GRS; a huge anticyclone) when present in the visible hemisphere, are the most conspicuous discrete cloud features. Sometimes, white spots (anticyclones in most cases) as well as dark spots (most often cyclones) are also visible. 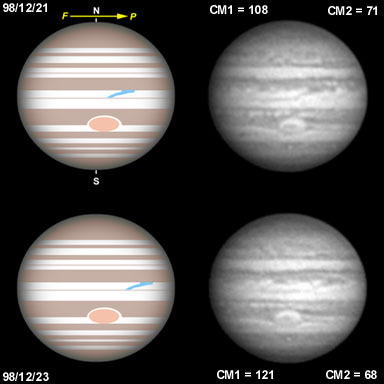 The determination of its drift rate with respect to other Jovian cloud features is one of the important contributions of amateur observation programs. Much less detail is visible toward the poles, namely the banded zone-belt pattern fond elsewhere. A considerable limb darkening difficults the observation of nearby features. At opposition, limb darkening is equivalent in both following and preceding sides. Before opposition the preceding limb is darker, the contrary being observed after opposition. In the above image (north is up and the planet's preceding limb is at the right), all images were obtained after opposition. When comparing the image obtained in 1999 with those grabbed in 1996, it is obvious that variation in belt/zone diameter and/or tint can occur with time. A well defined nomenclature is applied to identify the various regions, zones, belts and other specific cloud features present on Jupiter. 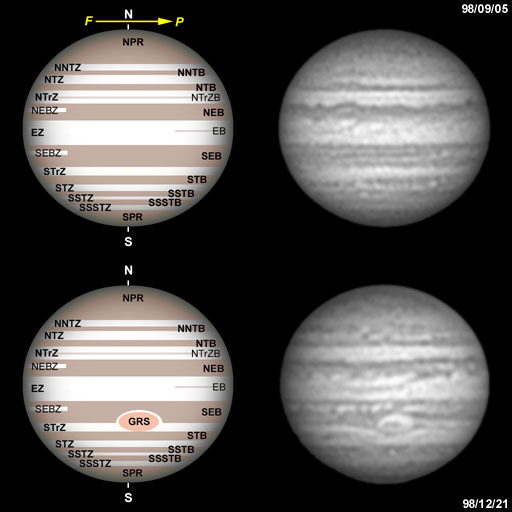 In the above figure, labeled schemes presented on the left are to be compared to the actual images of Jupiter shown on the right. NPR - North Polar region; SPR - South Polar region; EZ - Equatorial Zone; NEBZ - North Equatorial Belt Zone (not always present); NTrZ - North Tropical Zone; NTZ - North Temperate Zone; NNTZ - North North Temperate Zone; SEBZ - South Equatorial Belt Zone (not always present); STrZ - South Tropical Zone; STZ - South Temperate Zone; SSTZ - South South Temperate Zone; SSSTZ - South South South Temperate Zone; EB - Equatorial Band (not always visible); NEB - North Equatorial Belt (when the NEBZ is present, the NEB is divided into the northern - NEBn - and southern - NEBs - components); NTrZB - North Tropical Zone Band (not always visible); NTB - North Temperate Belt; NNTB - North North Temperate Belt; SEB - South Equatorial Belt (when the SEBZ is present, the SEB is divided into the northern - SEBn - and southern - SEBs - components); STB - South Temperate Belt; SSTB - South South Temperate Belt; GRS - Great Red Spot. Just as an example of the use of the described nomenclature, the equatorial blue festoons mentioned on the previous image and present in this figure, are originated in the southern boundary of the NEBs and extend into the EZ. It is also necessary to stress that some of the above described Zones or Belts can be absent or ill defined, either entirely or just in a specific range of longitudes. Any given white or dark spot/oval present on Jupiter can easily be identified according to its position within the Belts/Zones, to its longitude and/or to a number or letter pattern that reflects its discovery. In the above figure, a NNTB white spot, two NTZ dark spots, a STB dark spot, a STB white spot, and a two SSTB white spots are visible. Central meridian (CM) is an imaginary straight line that runs between planetary poles. 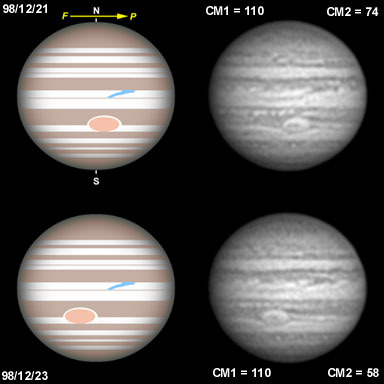 In the case of gaseous planets like Jupiter, which exhibit ever-changing cloud features and show differential rotation speeds at distinct latitudes, this simple line is a powerful observational tool for the determination of longitude. Due to planetary rotation from east to west (celestial; here from left to right), the positioning of the a given feature will eventually coincide with that of the central meridian. When this occurs we speak of CM transit of such feature. It is accepted that experienced observers can visually produce results with an error of only about 1 min. For small-scale cloud features like the NTZ dark oval labeled no.2 in the above image, a single time measurement during its transit is enough. In the same image, it is evident that the SSTB white oval labeled no.1 has already transited the CM, and that the NTZ dark oval no.3 will do so in a short time. In other words, we can say that the white oval no.1 precedes (P) oval no.2 and that oval no.2 is followed (F) by oval no.3. With time, all three ovals will reach and disappear at the P limb, while other features will appear at the F limb to later on transit the CM. 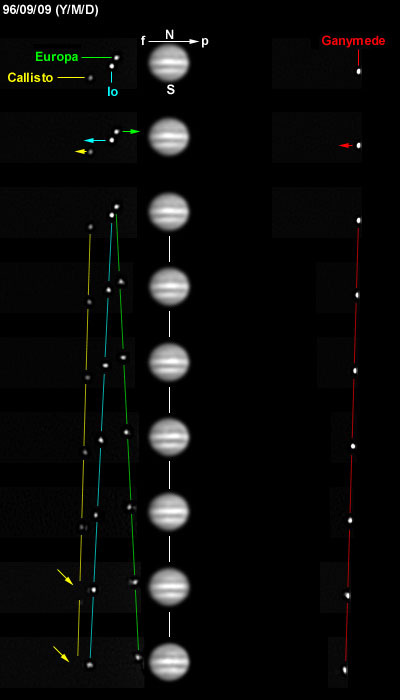 For large Jovian features like the GRS, time measurement of the central transit (middle portion of the GRS) is not sufficient and, usually, timings of the P and F ends are also obtained. In the example shown on this image, the transit of the P end of the GRS has already occurred, as has central transit, but a few minutes will have to elapse before the F end event takes place. The rotational period of Jupiter is very short, taking less than 10 hours for a full rotation to be completed. As a consequence, the planet's hemisphere that is visualized by a given observer can change considerably during a single observation session. The above image (north is up and P limb is on the right) shows that in a time-lapse of about 1 hour a STB dark spot has appeared in the F limb and that the GRS, well positioned at the beginning of the observation run, had time to approach the P limb. The fast planet rotation is well demonstrated in time-lapse animations, but it can determine some practical problems when one attempts to obtain images or to make surface feature drawings. This issue is discussed in the "Super-resolution" and "R-B Imaging" sections of this page. 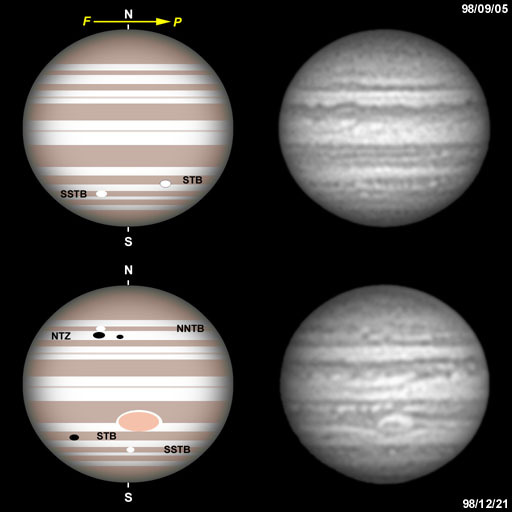 It is known for a long time that the rotational period of Jovian cloud features varies considerably with latitude. Such finding was an important clue, indicating to early observers that what they were seeing did not represent a solid surface, but instead it should reflect the existance of a cloud coverage over the planet. Of course it is now clear that there is no solid surface in gaseous planets like Jupiter. It was found that features present at the EZ, NEBs and SEBn rotated at similar speed (9 hours 50 min 30 sec for a full rotation). This rotation period was named System1. On the other hand, cloud features localized north of NEBs and south of SEBn have a similar albeit slower rotational period (9 hours 55 min 41 sec for a full rotation). This rotational period was denominated System2. The differential rotation periods of features belonging to systems1 and 2 are already quite evident after a period of 2 days. During that period (48 hours) Jupiter has time to almost complete five rotations, and the shift between previous aligned system1 and 2 features will be about 15�. The above images belong to image sequences obtained on December 21 and 23 ,1998. 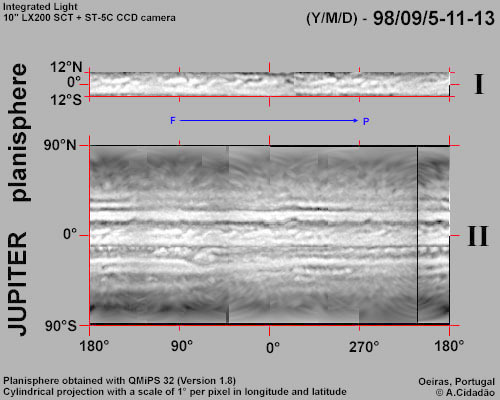 They were here aligned to the same system1 longitude (left image; CM1=110) and almost aligned to the same system2 longitude (right image; CM2=68 and 71). The shift between system1 and 2 features is quite evident. For instance, the EZ blue festoon enphasized in the cartoons from the left image remains aligned (EZ blue festoons rotate with system 1), but the GRS is noticeably retarded in the December 23 image (the GRS rotates with system 2, which exhibits a 5 min longer period than system1). This shift is obvious in the time-lapse animation. The opposite effect occurs when system2 features are aligned in images obtained two days apart (GRS in the right image). Under these conditions the EZ blue festoon is clearly more advanced than it was two days earlier. Once again this shift is obvious in the respective time-lapse animation. However, this animation also enphasizes that various system2 cloud features, namely the GRS and the SSTB white oval just south of it, may have different rotational periods (in this example the SSTB white oval rotates faster than the GRS). 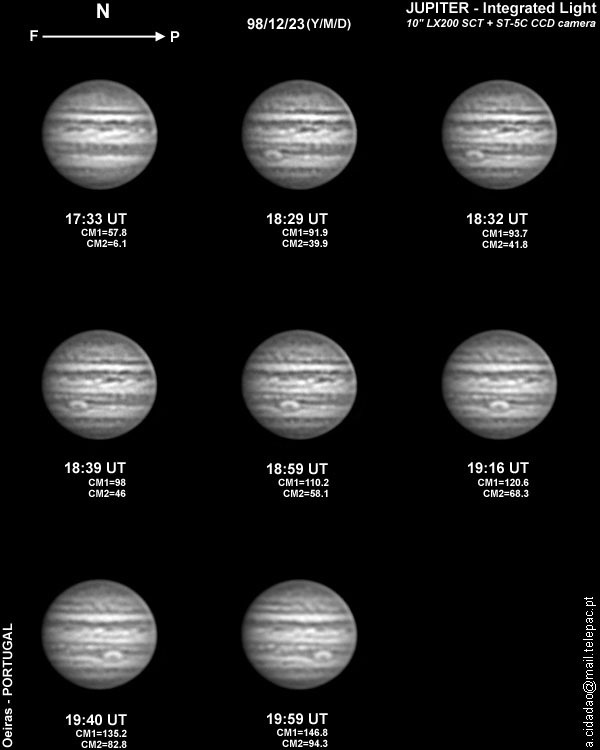 If weather conditions allow for a more prolonged and continuous window of observations, let's say during a week, the manifestations of the dynamic nature of Jovian cloud features becomes truly evident. 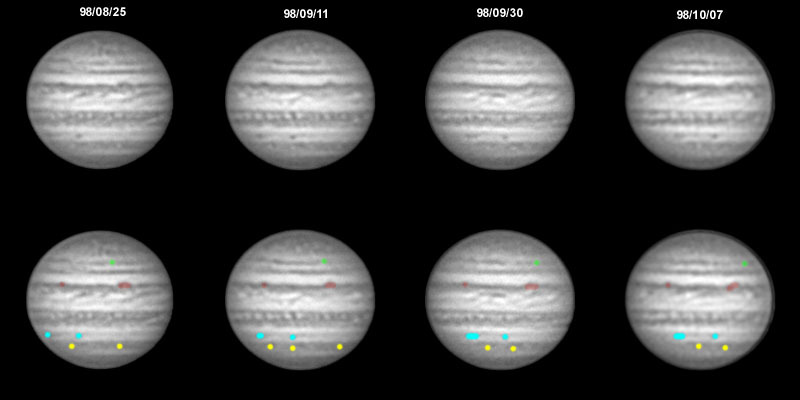 The above image and animation, exhibits the changes that took place after 5 (98/09/08), 12 (99/09/10) and 15 complete rotations (98/09/13) after the time when the first image was obtained (98/09/06). In all images the positioning of the GRS remains the same, thus representing an image alignment according to system2 coordinates. 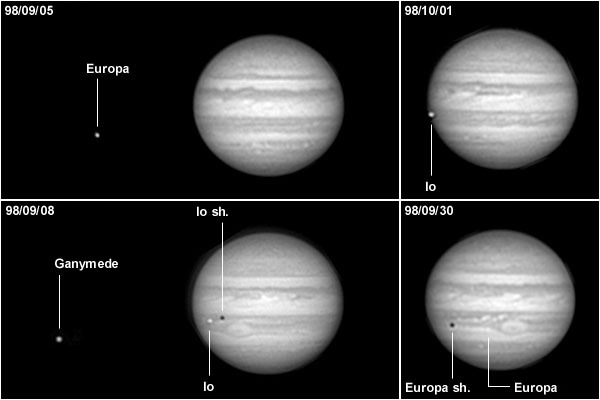 In the September 8 image, Io was in transit (arrow) with the respective shadow preceding it. As expected, typical system1 features like the EZ festoons (labeled in blue) showed a marked prograding motion with respect to system2 features such as the GRS (labeled light red) and NEBn dark streaks (red dots). Two SSTB white ovals (yellow dots) exhibited a slow prograding drift relative to the GRS, while a small STB dark spot (cyan) showed a much faster prograding movement. In the northern hemisphere, a NNTB white oblique rift (purple) displayed a fast prograding motion. One of the most obvious changes in Jovian rapid cloud dynamics occurred at the SEB white rift (green) that followed the GRS. If the window of observation is further expanded, e.g. for about five weeks as in the above example, the drift between different system2 cloud features becomes much more evident. Although the GRS is not visible at this system2 longitude (it is well beyond the preceding limb) note the almost unchanged positioning of the two NEBn dark streaks (red) and the contrasting prograding movement of the small NNTB white oval (green), of the two STB dark spots (cyan) and of the three SSTB white ovals (labeled yellow, not all visible at a given time but well demonstrated in the animation). Since the time-lapse between images was much longer than on the previous example, it is not possible to follow adequately the dynamics of the EZ system1 features. All Images and Texts on these pages are Copyrighted.